You are here: Home / All blog posts / My god, it’s full of goats! My god, it’s full of goats! 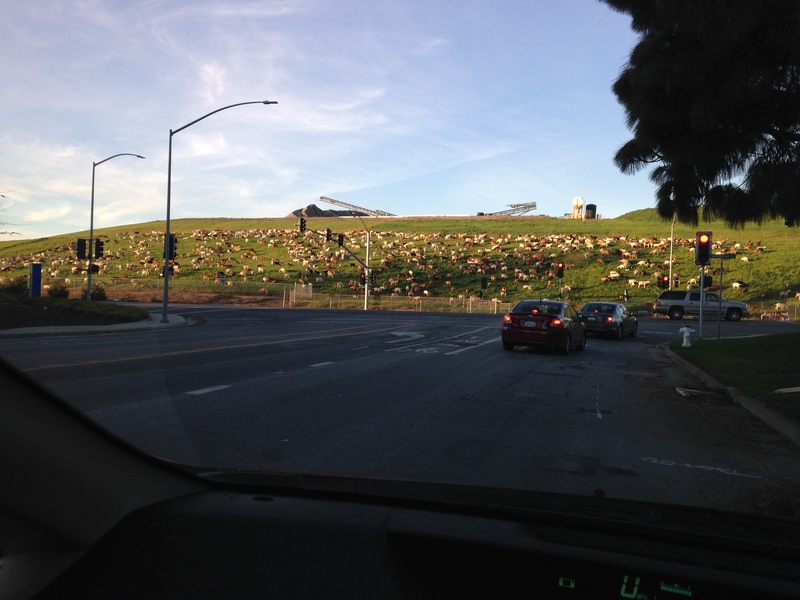 I gave Mike a ride home from work yesterday, and on the way, I passed a hillside full of goats! I’m used to seeing the occasional goat or sheep in rural areas, but not thundering herds of goats, and not near industrial parks! But Mike say they appear every year, brought in to trim the grass and help control fire hazards. Enough idle pondering! I have been busy on the book – twelve hours put in so far this week, and planning for another three hours today. That will make up my shortfall from last week and bring me back on schedule. In those twelve hours, I’ve completely rewritten two chapters, interviewed two more artists, and written exercises and examples for the entire first section (the one on design). I printed and reviewed the entire 119-page document with a red pen, doing some light line edits but also marking sections with awkward transitions or places where an introduction or conclusion needed to be written. The Introduction is still missing, and so is one other half-chapter at the end. There are also one or two places where I need to rework illustrations. But there are far fewer gaps than there were last week, and I’m going to close a lot of them over this three-day weekend. I am feeling pretty good about my ability to get something editor-worthy by my surgery date, which is just under four weeks away. In an effort to get some of the stuff off the garage floor, I’ve purchased two more sets of large utility shelves and will be setting them up in the garage this weekend. Of course that means massive rearrangement of Stuff, as all the clutter needs to be moved to the patio before I can set up the new shelves. 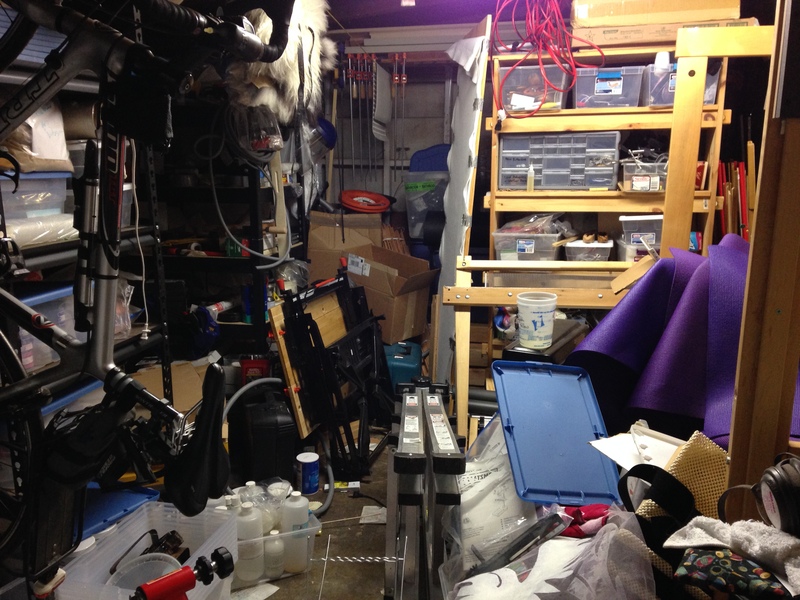 But I’m hoping it leads to more space, and neater space, in the end. I’m continuing to work on the sea turtles warp, but since shafts 36-40 are floating again, had to defer continued work until I had a chance to diagnose and address the dobby issues. I think I’ve figured out what’s happening, but am not 100% certain of the root cause. Figuring that out, and fixing it, is also on the list for the weekend. I want to be weaving! I’m also continuing to work on the candied citrus peel. It turns out that blood orange peel tastes boringly pedestrian (kinda like used sweat socks, actually), so I’m not candying those, but I have batches of candied Seville orange peel and candied grapefruit peel with rosewater syrup in process. They should finish by next weekend. Finally, I’m pleased to say that I have solved the Dilemma of the Helpful Kitty. You know – a certain cat (let’s call him “Fritz”) likes to come over and help me work, usually by walking right in front of the monitor and demanding to be petted. 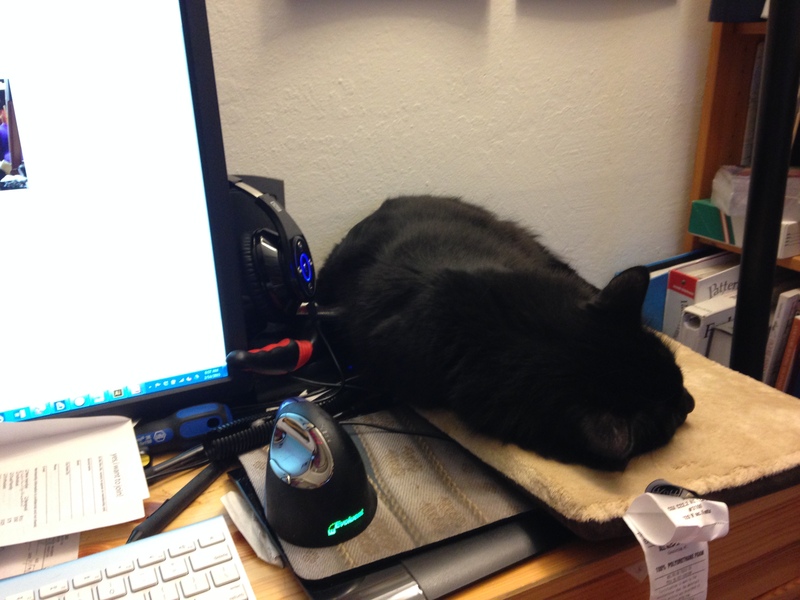 Then, after being adored for awhile, he curls up where my keyboard should be and wants to take a nice long nap. Since moving the cat is (of course) unthinkable, what does the poor human do in order to get work done? Fritz is a very luck boy! He just loves you a lot! I can relate to your garage:). 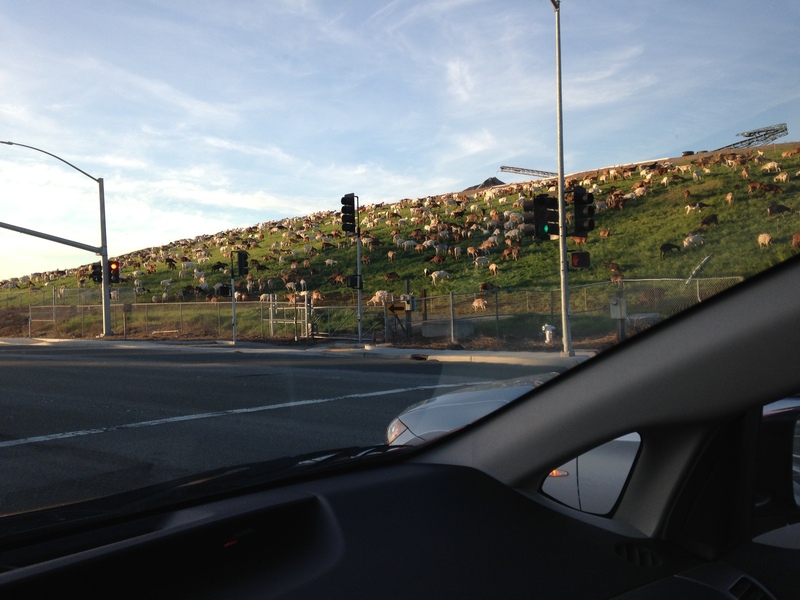 Love your blog..
Large herds of goats are a common site here… Even in urban areas… For brush control.